Dating from circa 1922, this figurative war memorial is prominently located at the crossroads in Crianlarich. Of importance to Crianlarich as a memorial to those who gave their lives in the Great War, the large battered square plinth is surmounted by a three dimensional kilted soldier with full kit and slung rifle. The whole is flanked by smaller square battered piers with linking battlemented benches. The plinth has a base course and an inset panel with names of the fallen and an inscription, 'TO THE GLORY OF GOD AND IN HONOURED MEMORY OF THE MEN FROM STRATHFILLAN WHO GAVE THEIR LIVES IN THE GREAT WAR'. The piers also have a base course and have stepped caps. Base and piers predominantly rough hewn pink sandstone, with some ashlar details. Sculpted figure, pink sandstone. 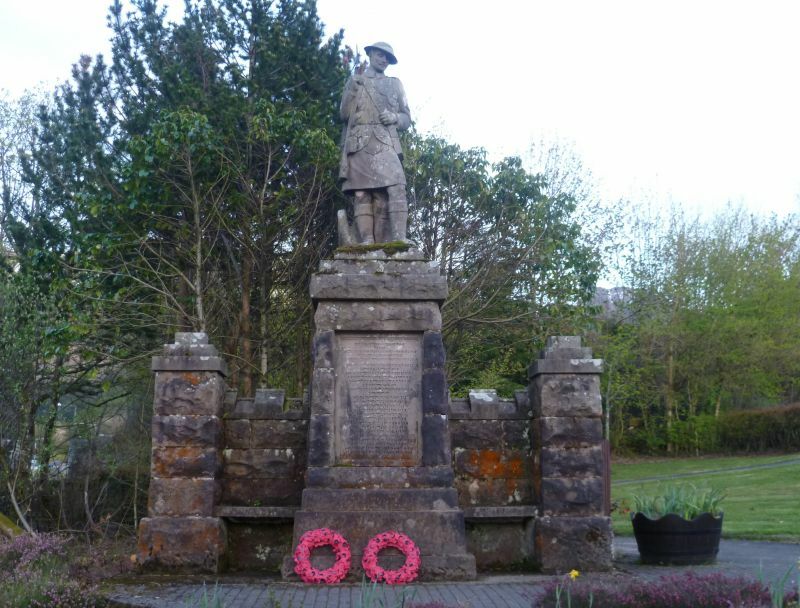 Buildings of Scotland attributes the War Memorial to Beveridge of Perth, however, the similarity to the contemporary figurative memorial at Killin by Alexander Carrick (see separate listing) suggests that this may be the work of Carrick.